This subtropical holiday home with temp. 25°-30 °C can be used all year round.From the huge veranda the guests can watch whales, dolphins and big vessels in the bay of the Indian Ocean as well as enjoy the view of sugar-cane plantations nearby - while enjoying the new created BBQ area. The rooms are furnitured in warm,rustic cosy African Style. The lounge has a 2-seater and a 3-seater sofa and a new TV (29'FHD LCD) - (SABC 1 2 3 & E ,basic Sport).The kitchen with fridge, freezer, a new Stove with Ceran Hob ,new washing maschine and a tumble dryer makes Self-Catering easy and comfortable. 1 bedroom( 2 single beds ) has a bath, toilet and sink attatched, 1 bedroom ( 2 single beds) has shower, toilet and sink attatched. The parking area is just close to the house. Unfortunately PETS are - not allowed. 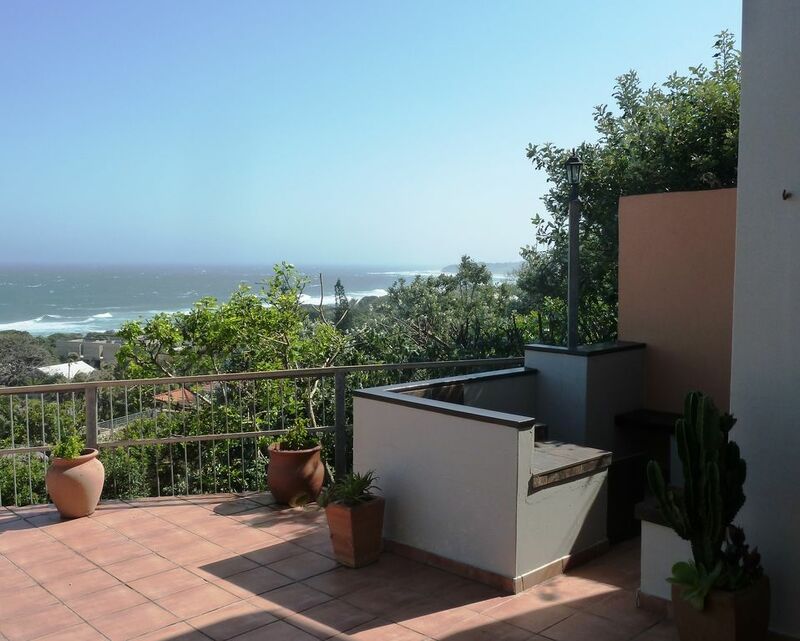 The Chalet is situated near Ballito a holiday village with modern Shopping Centers restaurants and entertainment.. Trips to interesting spots for example : - hiking in the ''Dragensberge' 2 hrs drive , - watching Game in' Hjuwlue /Umfolozi Game Reserve' by 2hrs drive, or - Hippos at 'St. Lucia Wetlands '2hrs. drive ( Unesco Nature Conservation) you can not decide easily !!! Sightseeing by driving through' Midlands Meander' is another option or last but not least Durban or Umhlanga with 'Gateway' the biggest MALL in the Southern Hemisphere !!! EXPERIENCE ALL OF IT and after that relax ' back home' at ' CHRISSY'S OCEAN WATCH ' in Blythedale Beach !!! P.S.The public beachfront area is under the jurisdiction of the local authority which is responsible for public recreational events such as beach festivals(poss.Xmas/NY) and enforcement of local bylaws. We had a wonderful time at this house, including the monkey families who visited us on a regular basis. The house is very well equipped and very comfortable. The sea views are fantastic. Overall the Blythedale Beach area, particular the municipal beach area, is in need of some love and tender care as it is extremely dilapidated and looks like time passed it by quite a few years back. Having said that there are plenty of excellent shopping, golf and beach facilities within a 20 minutes drive of the house. Wir haben eine wunderschöne Woche in Chrissy`s Ocean Watch verbracht. Der Blick von der Terrasse ist gigantisch. Das Haus ist wunderschön und gemütlich eingerichtet.. Man fühlt sich vom ersten Moment an wohl. Wir werden gerne wieder kommen. This apartment in Blythedale was a perfect place to end a five weeks journey in Eastern S.A. The village is small and quiteful at least in beginning of december. It´s easy to walk around in the village and on the beach and you can feel secure. In the village there is a (very) small shopping mall with food and liquery shop, a sea food restaurant and a hair stylist. The area where the house was situated lays above Blythedale Beach and with a beatiful wiev over the Ocean (Yes we saw delphins). In the area there was a pool which was very handy when the big waves make it difficult to swim in the sea. The house had everything we needed and the two bathrooms were very convienent even if we were just two persons. We cooked most of our meals at home and made braai (barbeque) on the teracce every night, even if it rained sometimes. For sunny days the terrace was lovely for sun bathing and relaxing, even if we had wished some more suitable sun beds and chairs on the terrace. We will recommend this apartment if you are looking for a quite and restful holiday and if we return to S.A. we most likely would stay at Chrissie´s Ocean Watch in Blythdale again. Das Haus liegt in einem sehr ruhigen und sicheren Estate nahe der Küste und verfügt über eine grosse Terrasse mit nahezu 180 Grad Meerblick (ohne Schatten). Die Inneneinrichtung ist praktisch, jedoch teilweise nicht ganz auf dem heutigen Stand (z. B. Bäder). Es gibt kein Telefon und kein WiFi. Das Haus eignet sich gut für zwei Personen, das 2. Schlafzimmer ist sehr klein. Gut (und im feuchtheißen Januar wichtig): Klimaanlage im 1. Schlafzimmer. Einkaufsmöglichkeiten im nahegelegenen Kwadukuza (10 min) oder besser in Ballito (20 Min). Gute Lage für Ausflüge nach St. Lucia oder in den Hluhluwe-iMfolozi Park (jeweils ca. 2 Stunden). Vielen Dank für Ihren Kommentar zu meinem Haus. Es war hilfreich für mich. Die Einrichtung von WLAN/WiFi ist beantragt und wird in Kürze erfolgen. Voll ausgestattete Wohnung in ruhiger Lage mit Top Aussicht. Ältere aber gepflegte Anlage. Baden wegen der starken Brandung und stärker abfallemdem Strand nur für geübte Schwimmer zu empfehlen. Auto ist Pflicht. Tagesausflüge nach Durban 70 Km möglich. Für Drakensberge & Nationalparks als Zwischenstop geeignet. Wohnung war sehr sauber. Ein Zimmer ist verschlossen. Kein WLAN. Gute nächste Einkaufsmöglichkeit circa 15 KM entfernt. Kleiner Laden und ein Restaurant/PUB vor Ort. Toller Urlaub, sehr nette und unkomplizierte Vermieterin, Unterkunft ist sehr zu empfehlen! Vielen Dank!